In this day and age, there's no excuse for a lack of communication on a construction site. Construction management software has made it possible for all workers on a construction site to communicate with one another at all times. Are you interested in utilizing construction project management software? Wondering which is the best software to utilize? Then read on! These are the absolute best construction management software of 2019. When it comes to project management software construction, all of the software reviewed below are toward the top of the totem pole. The goal is in picking the one which best suits your needs. Without further ado, these are the best construction site management software of 2019. If you're looking for a user-friendly construction management app which will vastly improve both communication and work efficiency, you need to consider Procore. This cloud-based app can be used on everything from PCs to laptops to tablets to phones and more, allowing it to be accessed from essentially anywhere. Procore offers assistance on all construction-related tasks, connecting the engineers, the architects, and the contractors alike. Acting as a readily accessible data entry point, it's basically a virtual meeting room for everyone involved in the construction process. A web-based software, CoConstruct is one of the most powerful and user-friendly construction management apps on the market today. This app can handle all construction-related tasks, including design, planning, client communication, scheduling, and more. Where CoConstruct really stands out is in its user interface. Characterized by easy-to-access tabs, it allows users to seamlessly access different features whenever they're needed. Because of this, it does a terrific job of handling changes over time. Another terrific construction project management software is PlanGrid. This app focuses on planning and drawing, in particular, allowing you to upload detailed drawings and blueprints in just a matter of seconds. However, it's more than just a sharing app. It also helps you to collect data with ease and draw up field reports seamlessly. For its intended purpose (sharing construction drawings with a group of people), it's about as good of an app as you're going to find. If you're looking for the most versatile construction management app in existence, look no further than Autodesk BIM 360. This app isn't the absolute best in any one facet of construction management, but it's toward the top of the totem pole in a variety of different facets. Autodesk BIM 360 can be used to draw up designs, communicate with team members, handle budgeting, create reports, assess safety, and much, much more. Possessing an easy-to-use interface, it's great for everyone from the tech-savvy to the tech-illiterate. A web-based app, e-Builder can be used for essentially all construction management purposes. Not only does it help with planning, but with budgeting, communication, scheduling, and bidding as well. Featuring an easy-to-understand interface, it's one of the more user-friendly construction management apps on the market. If you're looking for an effective way to connect the whole team at all times, e-Builder can get the job done for you. Another highly versatile construction management software that you might consider is Procore. This software can handle just about everything that pertains to construction management, including planning, communication, scheduling, bidding, reporting, and more. A mobile app, Procore can be accessed anywhere in which a phone is available. Featuring a user-intuitive interface, it's easy to use regardless of whether or not you know anything about technology. Around since 2003, Procore is one of the longest-running and most successful construction management software in the world. If you're looking for a stable, reliable software that can regulate all of your construction processes, look no further than this one. As far as construction management goes, there isn't a thing that Buildertrend can't do. Not only does this app allow for in-depth planning and financial management, but it also provides high-powered communication capabilities so that you can speak with customers and team members in a clear, concise, and efficient manner. A cloud-based app, it can be used on essentially any device with an internet connection. Most commonly, it is used on phones, allowing it to be taken anywhere. Featuring an attractive and easy-to-use interface, it's one of the most user-intuitive construction management apps in the world today. Looking to connect everyone involved with your work site, from the architects to the engineers to the supervisors to the workers and otherwise? If so, you might consider using GenieBelt. This app is cloud-based on can be used on all types of devices. Generally used on phones, it provides real-time updates on everything from design changes, to schedule changes, to budgeting changes, and more. If you're a roofing contractor, you might find that AccuLinx is the best construction management app for you. Designed for the purpose of helping roofers, it allows you to quickly draw up blueprints with full measurements and materials needed. In addition to this, it also allows you to track work progress, handle finances, and draw up reports. A user-friendly app, it can be used by essentially anyone with an ability to press buttons. In short, it has everything a roofing contractor could ever need in terms of a project management software. Aconex is an app designed particularly to handle workflow processes. It doesn't offer any benefit in terms of project planning but offers tons of functionality in terms of communication with customers and team members. Some of the features of Aconex include quality and safety control, report building, and document management, to name just a few. If you want to build a "paper trail" of your workflow processes, Aconex is just what you need. It will record each and every one of your transactions and interactions. Need Help Managing IT for Your Construction Site? Are you interested in utilizing construction project management software? Need help managing IT for your construction site in the Houston area? 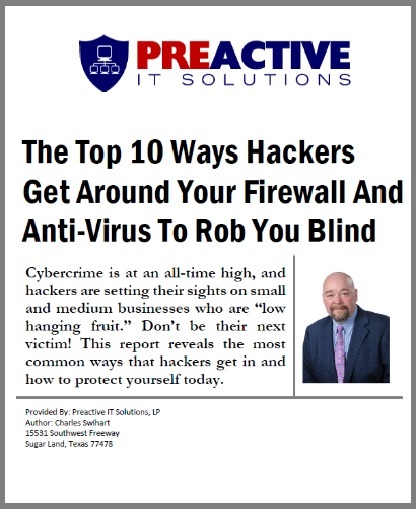 If so, PreActive IT Solutions can help. Our team is well-versed in the maintenance and upkeep of construction management software. We look forward to helping your team communicate in a thorough and efficient manner.